Browse: Home / killchain ~ A unified console to perform the “kill chain” stages of attacks. killchain ~ A unified console to perform the “kill chain” stages of attacks. For Kali Linux: “Kill Chain” is a unified console that will perform these stages of attacks: Reconnaissance, Weaponization, Delivery, Exploit, Installation, Command & Control, and Actions. 1) Tor — For the console build in anonymizer. 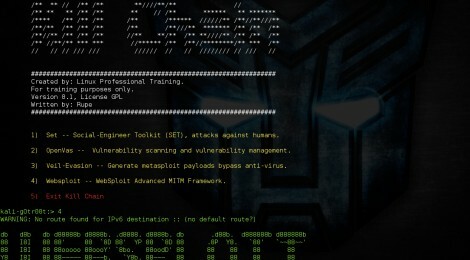 2) Set — Social-Engineer Toolkit (SET), attacks against humans. 3) OpenVas — Vulnerability scanning and vulnerability management. 4) Veil-Evasion — Generate metasploit payloads bypass anti-virus. 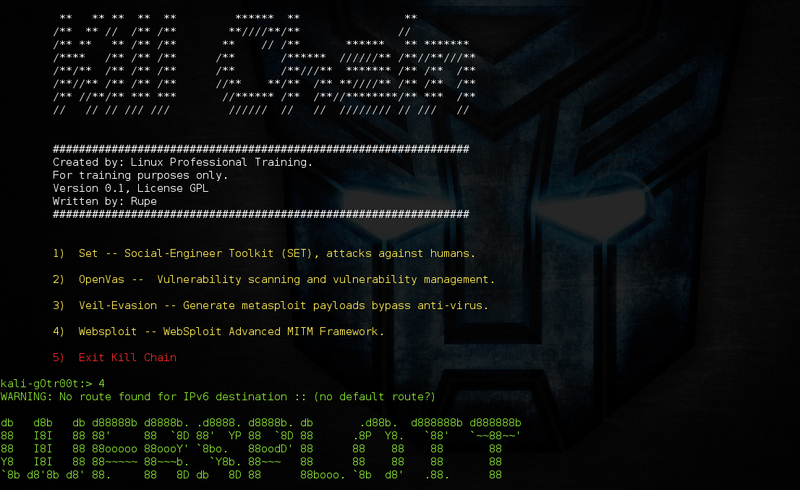 5) Websploit — WebSploit Advanced MITM Framework. 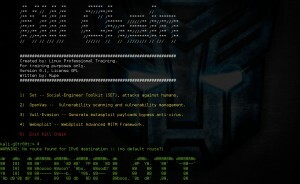 6) Metasploit — Executing exploit code against target. __date__ = "June 14 2015"
__copyright__ = "Linux Professional Training"
raw_input(c.Escape + c.Lgre + gethostname() + "-gOtr00t"
← AppSecSwissKnife – Open-Source network scanning tool for internal and external infrastracture vulnerability scanning.